Fortunately for the 27-year-old Cuban, doctors were able to surgically re-attach the missing portion of his ear, and subsequent skin-graft treatments were successful. Guerrero “has a chance to be up here,” Colletti added, but it will probably not be in the second-base role that Dodgers management envisioned for him out of spring training. Dee Gordon won that job and established himself as the Dodgers’ everyday leadoff hitter — then an All-Star. “We see him as a player who’s going to be versatile defensively — second, third, shortstop, maybe some outfield eventually,” Colletti said. 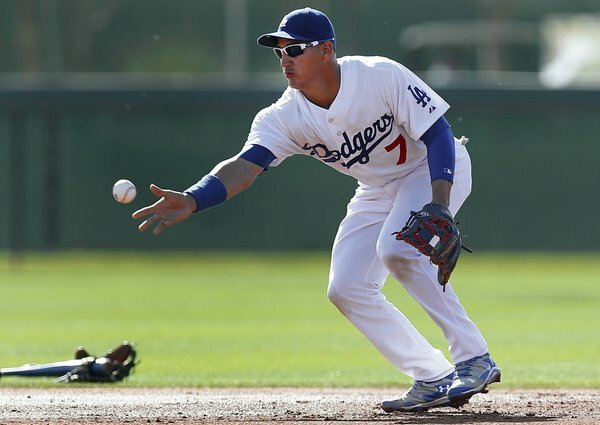 Guerrero has played those infield positions in the minor leagues this season but hasn’t been used in the outfield. This entry was posted in JP on the Dodgers, On The Farm and tagged Alex Guerrero, brawl, Miguel Olivo by J.P. Hoornstra. Bookmark the permalink.